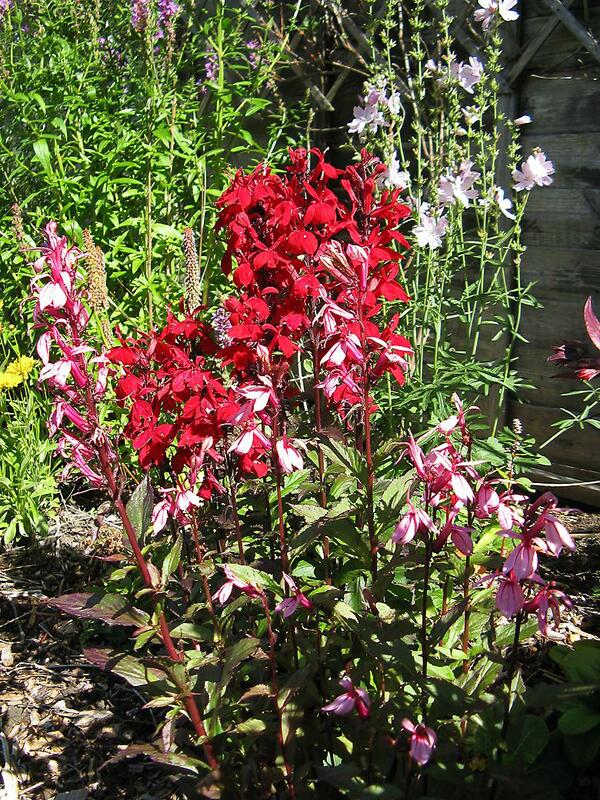 This is L 'Fan salmon' at the front and just behind it L 'Starship scarlet'. The 'Starship scarlet' which was one of my favourite plants of last year did not survive the winter, so this is a replacement for this year. The 'Fan salmon' was severely eaten by snails last year. Most of the leaves were stripped off as well as the outer part of the stalks and unsurprisingly there were hardly any flowers on it. 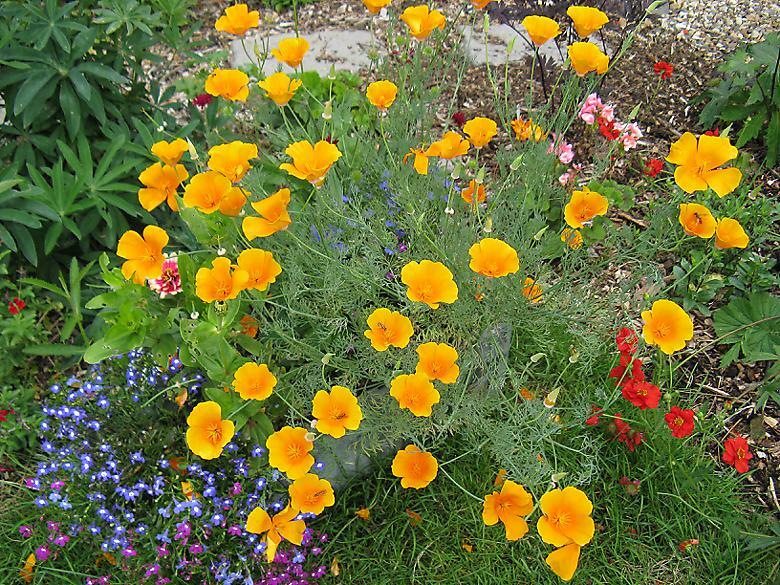 However it did survive the winter and is flowering now. The flowers are less dense than the Starship. Also there is Sidalcea 'Little princess' and Lythrum in the background. The plant has spread greatly since last year. However not really more flowers, at least so far. 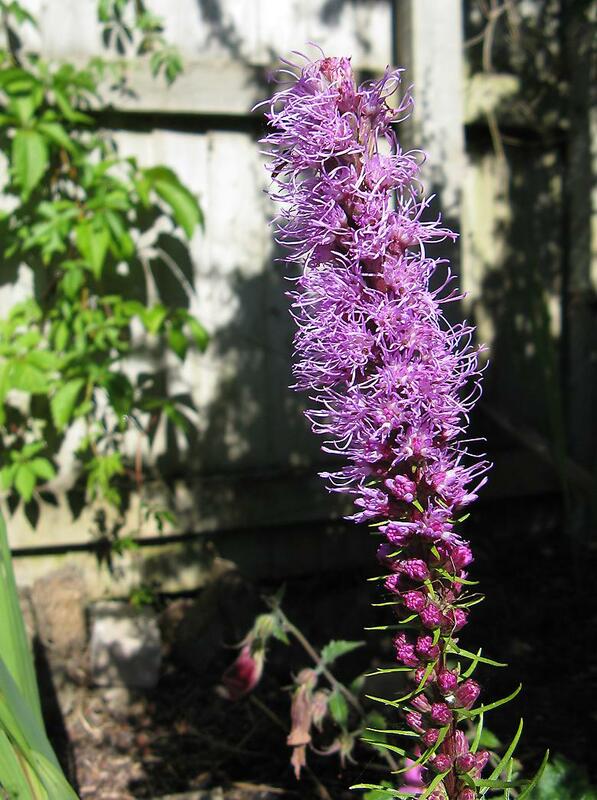 After last years Liatris disaster, where there was not a single flower, this year I have about four. I did plant a few more this year and I do not know how many, if any, from last year came back. 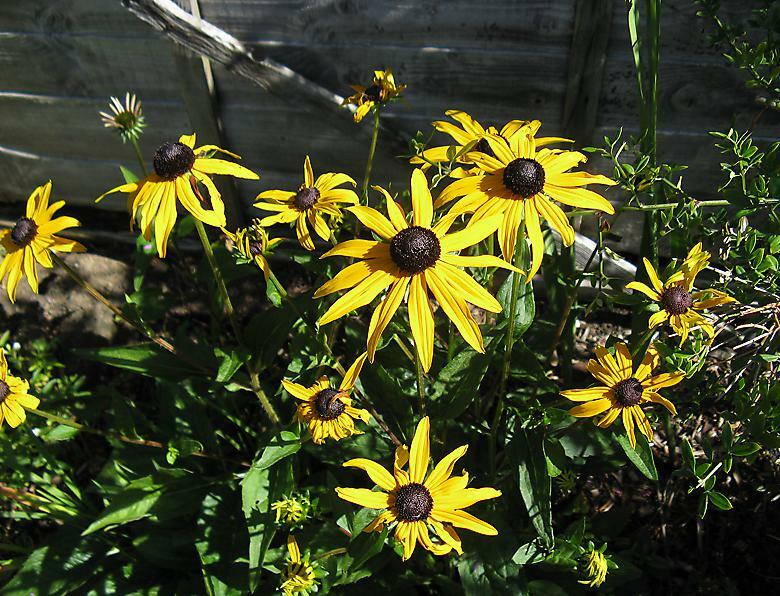 I will see if they survive the winter, they are reported to not do well with winter wet, which is what they are likely to get in most parts of the garden. 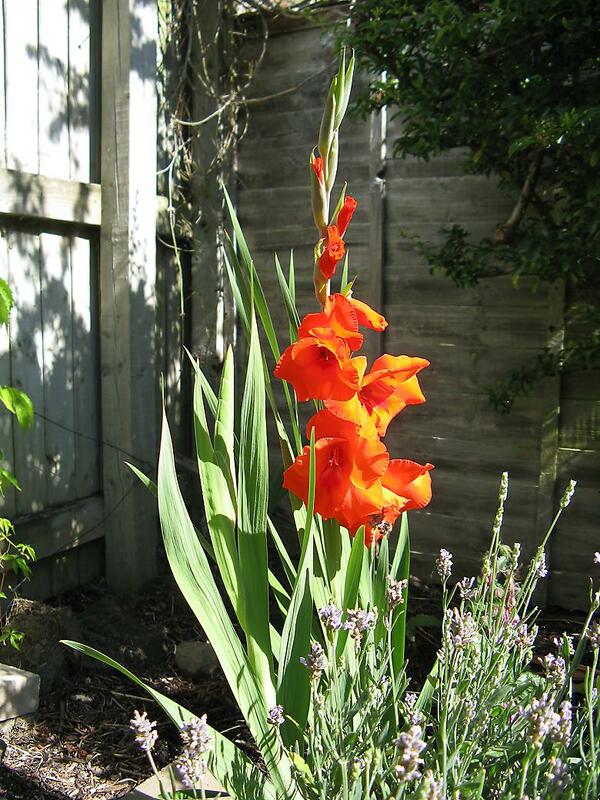 I acquired 70 Gladioli bulbs this year, then didn't really know what to do with them. There are 50 Cotton candy mixed which were planted in containers and in various places around the garden. There are also 20 Blue Mountain which are not out yet. They are planted all together and I am looking forward to seeing those out, as I think they might look quite impressive. The first ones out are all red or this orange colour. Although it looks distinctly orange in the photo, it doesn't look much different to the red one in real life. These came out of nowhere, there were none last year. Digging up the lawn must have brought some seeds to the surface perhaps. 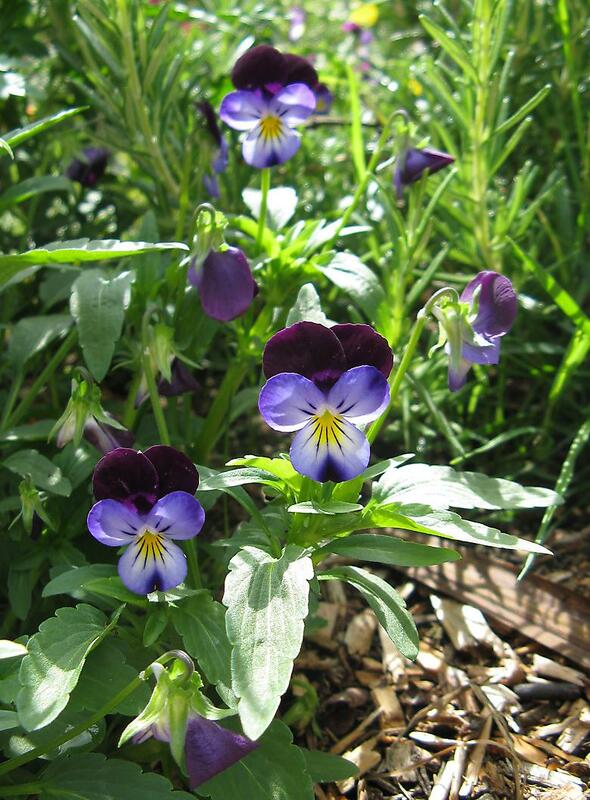 Anyway there are several Viola in the same area. This is the most visible one, the rest are between other plants.